We had this idea. With so many stations dealing with reduced staffs and working within increasingly tight budgets, we wondered wouldn’t it be cool if we could create a fresh, no-hassle on-air look for the morning news — an increasingly valuable part of every station’s daily schedule. Thus “It’s All About Early’ was born. This is a video AND audio package designed to make local stations look and sound better immediately and affordably. And it seems to have struck chord with many. In fact, thanks to some amazing client feedback we’re heading back into the studio to cook up a second round with slightly edgier look and sound. Stay tuned for that. 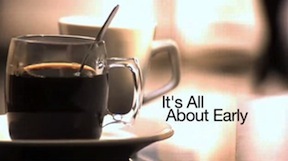 In the meantime click here to check out our current “It’s All About Early” campaign.